I love visiting Grandma in her new home! We realize that moving to a special care home can sometimes be a difficult step for seniors as well as for those around them. We are there to make the transition easier. Our caring and understanding staff will welcome you, advise you and will help make your stay a happy one. 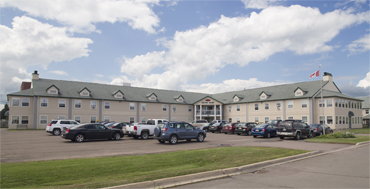 Manoir Notre-Dame Manor (“the Manor”) has offered seniors an exceptional living environment since it opened its doors on February 1, 1996, with 56 rooms. In 1997, an additional 20 rooms were added, with 20 more coming in 1999. My father was very apprehensive about entering a special-care home. He didn’t want to lose his independence, but he was unable to care for himself. He adapted very quickly upon admittance to Manoir Notre-Dame Manor – faster than I would have ever thought. We felt great relief having him there and knew he was safe. Staff looked out for him and were always very pleasant and professional. My brother Roger, sister Sherri and I were very happy with the care provided to our father – Bernard Cormier – and I would highly recommend Manoir Notre-Dame Manor to anyone. Following the passing of our mother, Patricia Jaillet, I join my other family members in expressing our sincere thanks to the staff of Manoir Notre-Dame Manor for the wonderful care you provided. Over the past few years as our mother suffered from old age and illness, we have no doubt that your kind words, smiles and a total devotion to her care contributed to her physical and mental wellbeing. From the bottom of our hearts, we give you our sincere thanks. © 2019 Manoir Notre-Dame Manor. All Rights Reserved.